Your browser does not support the video tag please upgrade your browser. John & Teresa are fine musicians, singers and entertainers. Their shows contain all the ‘Old Favourites‘ and Comedy songs. We will make every family party special, & every show for a club or conference a night to remember! Our Pearly King & Queen will welcome you with a smile, a song and a photo if you would like a souvenir of your event in London. 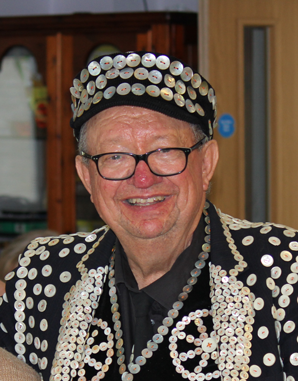 As well as the music and meet and greet, our Pearly King and Queen will circulate, socialise and if anyone would like to know anything about Cockney Rhyming Slang – John our Pearly King is a world expert! Why not invite us along to your event? We specialise in bespoke corporate event entertainment. Get in touch with us to discuss your event requirements in more detail. I think it’s safe to say that everyone who came along by the end of the evening left feeling all warm and happy inside. So our thanks to you and your Queen and the rest of your team. I will certainly remember our evening of Pearly King and Queen and won’t hesitate to recommend you guys to anyone I hear looking for a great evening of good old fashion fun. You certainly have a special touch for bringing happiness to others. You certainly captured your audience on Sunday at the British Airways Club. The phone hasn't stopped ringing with thanks for a wonderful Sunday afternoon of good food and fabulous entertainment. On behalf of us all our sincere thanks for a most entertaining afternoon, keep up the good work. "We have just had the most fantastic nights entertainment provided by John and his band for our themed evening. As our party had a mix of ages from 19 up to 60 I wasn't sure whether the youngsters would enjoy the music, I couldn't have been more wrong the whole room was up and dancing, singing along and waving their flags. John and his band created a great party atmosphere which made it a night to remember. From the initial quotation stage right through to the end of the evening John and his band were professional, friendly and helpful. I would highly recommend them and would certainly use them again in the future." "I just wanted to thank you for Saturday, and all that you did, you made my dad feel so special! Everyone that was there told me that it was nice to have something different and they thoroughly enjoyed your performance. which makes it all worth while! and that was down to you and your band. So thank you once again!" A big, big thank you, to you and Tricity for once again entertaining us all so well. Of course many of our guests remembered you from our Golden Wedding party in 2007. It was a shame about the bad weather forcing you to work in such a confined space but neither of these factors detracted from your performance and you brought out the old true British fighting spirit. Everyone loved it. Once again, many thanks to you both, If all goes well we have the "Diamond do" in 2017 and then with luck the 90th birthday in 2025. "I am so glad that we found you both it worked really well. Everyone said how hard you worked as you didn't stop singing all the time that you were with us. Guests commented on how good you both were and where did I find you. Thank you for coming along - my mum was delighted to see a Pearly King and Queen again after such a long time and people said that they hadn't enjoyed themselves so much in years. " "Thank you John! My grandparents had such a wonderful time, celebrating their birthdays with all their friends and family. Everyone said how wonderful you and Terri were and the 'meet and greet' went down so well, really made the event! I would definitely recommend you in the future and it was lovely to meet you and I am so pleased you were able to join us in our celebrations." 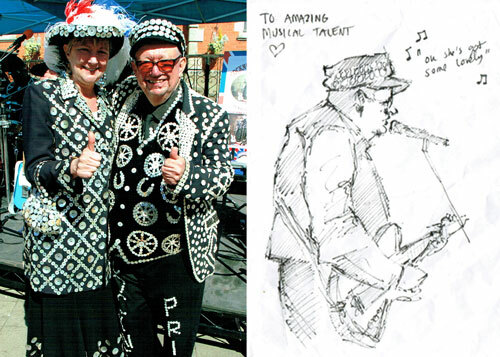 If you would like to enquire about the availability of the Pearly King & Queen Tribute then please fill in the form below with as much detail as possible and we'll get back to you straight away. Planned date of your Event?